We’ve written before on this blog about West Virginia Republican Rep. David McKinley. He’s not a big fan of environmental regulations, especially those that might improve the handling and disposal of toxic coal ash, and definitely doesn’t like federal regulators. The adverse health effects of air pollution are well known and fully documented in the scientific literature. Equally well established are the health and economic benefits associated with reductions in air pollution. For these reasons, the American Thoracic Society strongly urges Congress to reject any legislation that limits, weakens or delays the ability of the Environmental Protection Agency to implement the science based standards of the Clean Air Act. … The “Energy Consumers Relief Act” would require that, prior to finalizing a rule estimated to cost at least a billion dollars; EPA must first submit a concise cost analysis to Congress. This analysis will provide the public with greater transparency by requiring the inclusion of such things as the impact of the rule on gasoline or electricity prices, as well as any potential job losses. … Would only reinforce and amplify the problem of under-regulation at the EPA, preventing the agency from addressing many of the environmental and public health risks noted above. This result would no doubt elate corporate interests by helping them protect their already healthy bottom lines. But, the toll it would take on the general public would be unconscionable. Did you have any children who ever went outside without a coat on and they got sick for being outside? I’m just curious, did this person have a level of personal accountability? If he had a pulmonary problem and stood there in front of an exhaust pipe for five minutes that you referred to, didn’t he just step back? Did you ever tell him that? Or did you say let’s blame the government or let’s blame that bus for running there? Well, he was intubated at that point, so I couldn’t raise the question. The arrogance of David McKinley is disgusting to say the least. I attended a hearing where McKinley asked a witness a question and then spent the remainder of his time berating them, never allowing them to answer the question. His disrespect for democracy and the democratic process is obvious. I suppose he also believes that those of us living beneath MTR blasting have a personal responsibility to not breath. The sooner this guy is replaced the better. This man is not representing the people of West Virginia. He is representing coal and gas. He needs to be voted out of office . 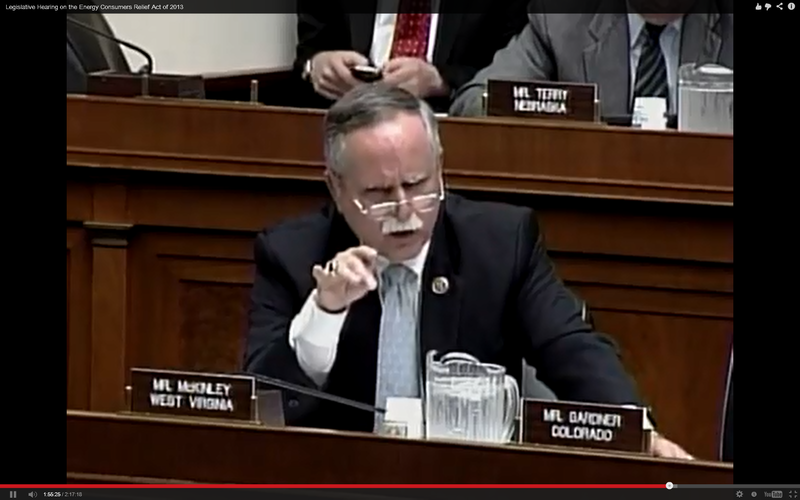 Rep. McKinley prefers to keep his head in the sand. And meanwhile, kids diagnosed with asthma, and kids with unmanageable asthma, in WV will remain at the top of the national list. He doesn’t know, and he doesn’t want to know. And meanwhile, the kids suffer.